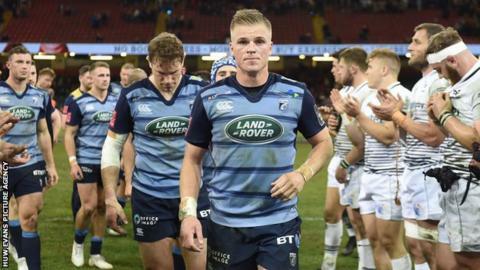 Ospreys have made a "statement" by signing Wales fly-half Gareth Anscombe from Cardiff Blues, according to former Blues player Nicky Robinson. Blues wanted to keep Anscombe but he will join their regional rivals at the end of the season. A quirk of fate means the 27-year-old's final regular season game for the Blues will be against Ospreys on 27 April. "It's not a great sign for the Blues but for the Ospreys a very positive one," said ex-Wales fly-half Robinson. "They've made a statement. They've gone hard to get someone like Gareth because they think they needed someone like that, a figurehead, someone who can drive them forward along with the other senior internationals they've got. "As a former Blues player and a supporter, I'm a little disappointed one of their star players, one of their senior international players, has decided to leave for another region." Robinson spent over a decade with Cardiff RFC and the Blues over the course of two spells in the Welsh capital, and he was briefly a team-mate of Anscombe's during his second period at the Arms Park. Since joining the Blues from the Chiefs in New Zealand in 2014, Anscombe has scored 597 points in 76 appearances for the region and this season has established himself as Wales' first-choice fly-half. He helped Wales win the 2019 Six Nations Grand Slam but his regional future had been unclear during a period of uncertainty in Welsh domestic rugby. Blues and Ospreys face each other in the crucial final regular Pro14 match on Judgement Day at the Principality Stadium on 27 April. The winner will earn a Champions Cup play-off place with the game being played in mid-May - which means Anscombe could play a part in helping his current side beat his future employers in that match. "I would love to see him starting," Robinson told BBC Sport Wales. "Gareth would love another opportunity to play for the Blues, to say thank you to the supporters and the people who've shown faith in him, who've given him the opportunity to play for the region and to go on to play for Wales. "I know as the professional he is he'll want to go out and give 100%, knowing the fact the Blues winning and getting a play-off game to get into Europe the following season. "I know that has ramifications for the Ospreys and for him next year but I hope he would be professional enough - and I know he would be - to go out and give 100%. "If the Blues want to beat the Ospreys they need to pick their best team and of course someone like Gareth would be in their starting line-up."